Built in 1884 and situated deep in the beautiful Sussex countryside, Highley Manor lies in its own estate covering 7.5 acres of landscape gardens and woodland. Highley Manor is steeped in history, in 1669 "The Manor" became the home of the Shelly family and romantic poet Percy Bysshe Shelly moved to Highley from nearby Field Place in the early 19th Century. In the high living 1920's it achieved most of its fame and notoriety. The exiled king of Portugal took over the Manor from time to time and guests would be entertained by a young Sybil Thorndike. Rumour has it that Edward Prince of Wales, the uncrowned Edward VIII, entertained Mrs Simpson at Highley. During World War II Highley was used as a base for the Canadian army but later it was lovingly restored by its present owner Mr Bruce Stewart and is now a beautiful country house hotel which acts as a wonderful reminder of the rich history which surrounds Highley Manor. Highley Manor has five different areas for corporate functions, with full flexibility to adapt to changing numbers of participants and varying seating configurations. French windows open out to spectacular views, stone terraces and landscaped gardens. A marble Adam fireplace compliments the grand chandeliers and between the two of them, these conference rooms can accommodate 130 people. A smaller facility, evocatively known as Poet's Room hosts meetings for around 10 people, while the Baronial Hall can seat 65 delegates. This was once the Shelly family's private chapel and with its wood panelling and high vaulted ceiling, is aromatic with historic atmosphere. 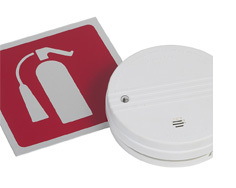 PHOENIX EXECUTIVE FIRE ADVISORY ASSOCIATES came on the scene when a Fire Risk Assessment revealed that whilst the hotel had held a fire certificate issued since 1980, there were a number of items that required updating, not least the fire detection and alarm system. This posed a problem as some of the function rooms have delightfully ornate decorative ceilings. Mr Stewart had received two quotes already, one for a hard-wired system at a cost of £19,250, and one for a wireless system for £24,254. The dilemma was that the hard-wired system would mean cables or conduit damaging these delightful ceilings In addition to this there were other requirements, additional extinguishers, signage that complied with current regulations and staff training. 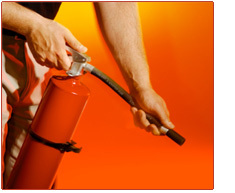 PHOENIX EXECUTIVE FIRE ADVISORY ASSOCIATES found the solution. By working with our associate companies we were able to develop a fully compliant alarm system that incorporated a hard-wired system in the main part of the hotel, with a linked wireless system covering the ornate ceilings, we fulfilled all of the other requirements of the West Sussex Fire & Rescue Service mentioned above, and in addition included the Portable Appliance Testing (PAT), for a total sum of £20,000. The client was extremely pleased as we had saved him a substantial amount of money, at the same time delivering a high quality service, indeed a professional service at a reasonable cost.